Honeybees are Buzzing! Sun, Rain, or Snow! 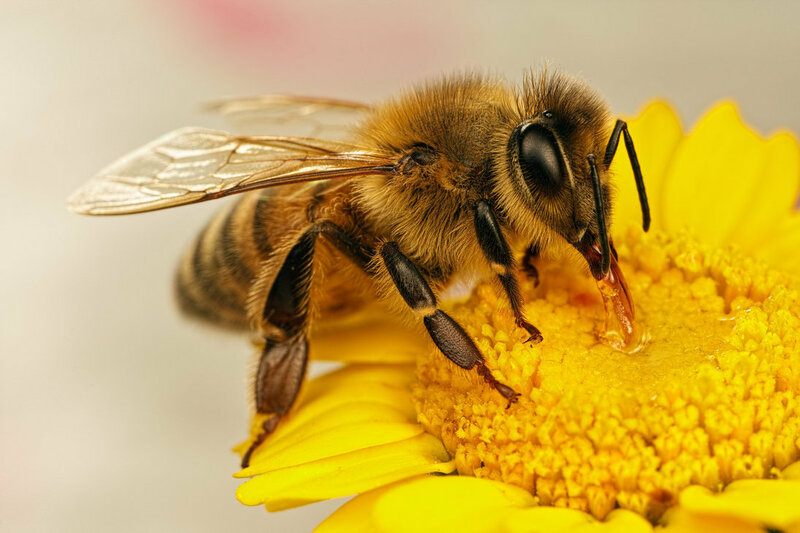 Honeybees would love to spend every day of their lives collecting nectar and pollen. However, sometimes weather can become a problem. Below, you will find the answers to what honeybees do with their day depending on the weather outside their hive. Honeybees love sunshine. When it’s warm and sunny outside, special worker bees called foragers leave the hive in search of nectar and pollen. Later, they bring home their treasures to store in the hive. The nectar is transformed into honey, and the pollen is packed away as is. The bees back at the hive work to raise young bees, transform the nectar into honey, make beeswax, guard the hive, and perform a variety of other jobs. Honeybees forage when it’s nice and sunny outside because that is when the flowers produce nectar for them to gather. They gather and store food so when there aren’t any flowers to visit, they have food saved to live on. The bees eat honey as a source of carbohydrates and pollen as a source of protein. They are so good at their job of creating honey, that they often produce as much as 40 to 100 pounds more of it than they need for themselves. Imagine trying to run across a yard with giant bowling balls falling from the sky all around you. That is what it would be like for a bee to try to fly in heavy rain. 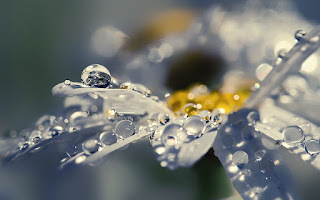 When it rains hard, honeybees are unable to fly because the rain drops knock them out of the sky. Honeybees are unable to swim, so if they get knocked into a puddle, they will die. During a light rain, honeybees may be able to fly, but the cold will chill their flight muscles and make the job more difficult. 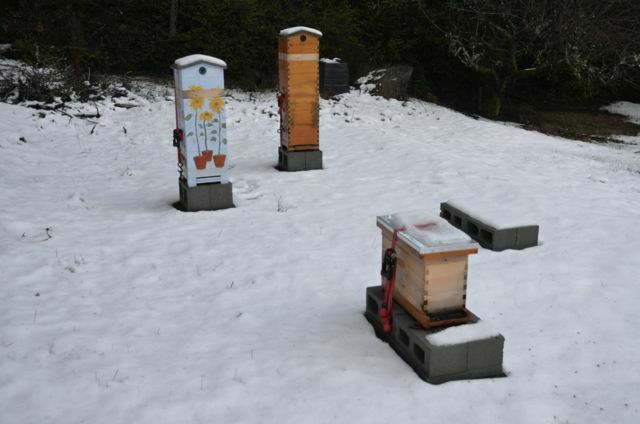 Honeybees that get too cold may lose their ability to move. For these reasons, honeybees prefer to stay in the hive when rain is on the way. Luckily, honeybees can sense when it is about to rain because the pressure in the air changes. Honeybees that are away from home and sense rain coming will do their best to return home before the rain begins. 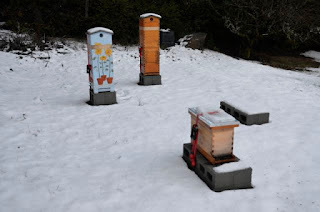 Back at the hive, forager honeybees will take on new tasks or rest until the rain clears up. Some may become guard bees and stand at the entrance of the hive watching for intruders. Others may use their bodies to generate heat throughout the chill of the storm. The important thing to remember is that honeybees all work for the better of the hive. Just because the foragers can’t complete their job of leaving the hive, doesn’t mean they’ll give up on work all together. Instead, they will change their plan for the day and help their siblings within the hive. In many states, it snows during the winter. During this time, honeybees rarely leave the hive. Before winter begins, the worker bees kick all the drones (male bees) out of the hive because they no longer need them. Then, all the worker bees cluster around the queen to make sure she stays safe and warm. The worker bees spend the winter eating the honey they have stored and using the energy to shiver their flight muscles to produce heat. The honeybees keep the core of their cluster at around 93 degrees Fahrenheit. Their only job when there is snow outside is to stay alive and warm. They do not forage for nectar because there are no flowers to visit. They also don’t raise young bees or make beeswax. When the weather warms and the snow starts to melt, the bees will once again begin raising young bees and creating honey.